NYC, 02/21/2019, 6:00PM. Native Sounds Downtown. The Garifuna language is an offshoot of the Island Carib language, and it is spoken in Honduras, Belize, Guatemala, and Nicaragua by the Garifuna people. It is a language with French, English, and Spanish influences, reflecting their long interaction with various colonial peoples. 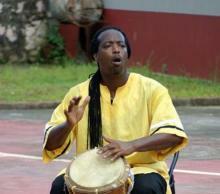 James Lovell is a cultural ambassador who preserves traditional Garifuna music, dance and language, sharing it with audiences around the world. He is a passionate educator, activist, a storyteller and a multi-instrumentalist — including percussion, guitars, voice, clarinet, sax and euphonium.